If you have been to your local pet store recently, you might have noticed the dog food aisle is no longer one small strip in the back of the store. Instead, it is two to three aisles packed full of dry dog food. Some claim to be all-natural but then have ingredients like meal or byproduct. Others say they are grain-free, but still have “flours” listed. Reading the back of a dog food bag might make you feel as though you need a chemistry degree. Luckily, you do not have to wander down the aisles and try to decode what manufacturers are telling you. 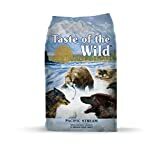 Instead, you need a curated list of the best dog foods pre-screened for all the nasty additives and one that focuses on your pet’s well-being. 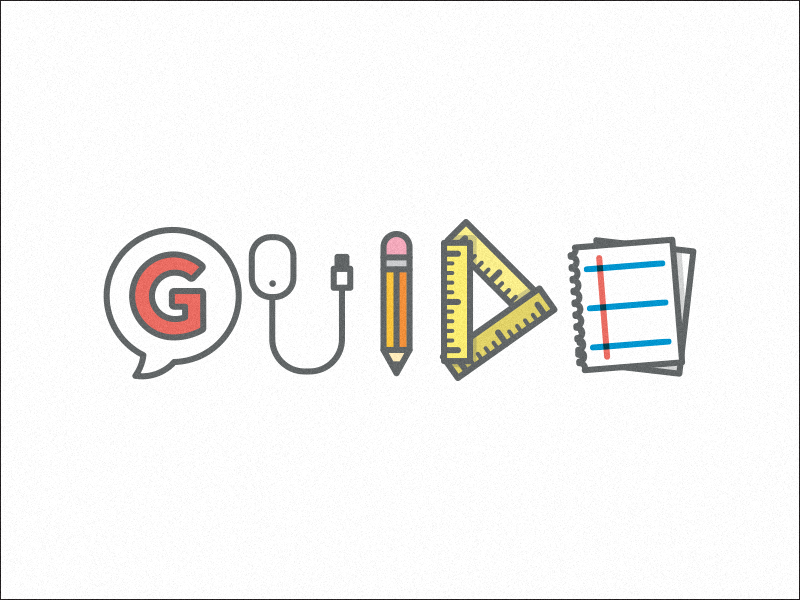 Should You Use BARF Instead? Today, you have dozens of brands to choose from for your dog’s nutritional needs. Many advertise themselves as “balanced,” and some are audacious enough to label themselves as “vet approved.” One word of caution: any brand stating they are veterinarian approved has violated the AAFCO labeling rules. Therefore, you should avoid them altogether. Main Ingredients: We want to know what real food ingredients contribute to the fat, protein, and fiber content of your dog’s food. We go from the first ingredient listed to the last to ensure the brands suggested only use whole foods and no byproduct or filler. Foods listed on the back of a dog food label are done so by weight (with the first item being the heaviest concentration). For the main ingredients, we list the first five. 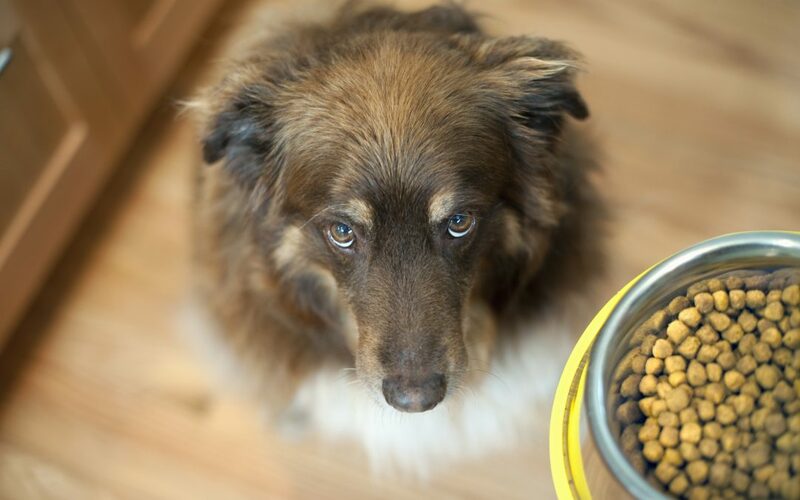 We Cut the Toxic Items: While dogs can eat certain human foods, others are toxic. We removed any brand that uses known toxins, including grapes and garlic. Grapes, including raisins, are highly toxic for dogs, according to the AKC. While garlic is not toxic, it is hard to digest along with other items in the allium family (e., onions), says the AKC. We Rejected Sources of Artificial Fillers and Additives: All dog brands have additives to increase the vitamin and mineral count, but chemical preservatives and artificial colors have no place in dog food. Instead, we want to see natural preservatives like rosemary. The Overall Cost: Dog food gets pricey, especially if you have an active large breed dog taking in over three cups of food per day. While you should never buy bargain brand or consider price alone, you have a budget, and we want you to find a dog food that fits it. To make your job of shopping for the right dog food easier, we have organized our top 10 best dry dog food brands based on their small, medium, or large breed formulas. 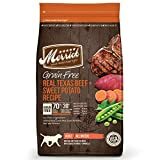 Merrick’s grain-free formula focuses on real beef, vegetables, and fruits for a potent blend of vitamins and minerals for your dog. It is free from gluten, artificial colors, and artificial preservatives. Merrick products are all made in their Texas facility using ingredients they source from local farmers. Main Ingredients: Deboned beef, lamb meal, peas, potatoes, and sweet potatoes. Other Ingredients to Note: Pork fat, potato protein, flaxseed oil, deboned salmon, salmon oil, blueberries, alfalfa, and apples. Cost per Pound: Comes in 4, 12, and 25-pound bags averaging $2.39 per pound. Guaranteed analysis shows 38% protein, 15% fat, and 3.5% fiber. Taste of the Wild focuses on whole food nutrition using real fruits, vegetables, and dried chicory root. 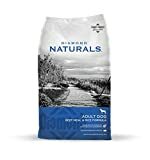 The company prides themselves on using powerful antioxidants from natural sources, and they use a proprietary K9 probiotic blend for better digestion. Main Ingredients: Salmon, ocean fish meal, sweet potatoes, potatoes, and peas. Other Ingredients to Note: Smoke salmon, lentils, dried chicory root, tomatoes, blueberries, raspberries, and acidophilus. Cost per Pound: Bags come in 5, 15, and 30-pound sizes averaging $1.61 per pound. 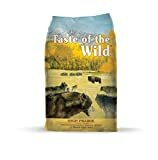 Taste of the Wild has a 25% protein, 15% fat, and 3% fiber in their guaranteed analysis. Nutro Ultra uses farm-raised chicken from the U.S. They also focus on whole grains, soluble fiber sources, and antioxidants. You never find artificial flavors or colors in Nutro products either. Main Ingredients: Chicken, chicken meal, whole brown rice, brewers rice, and rice bran. Other Ingredients to Note: Oatmeal, beet pulp, kale, pumpkin, spinach, blueberries, apples, carrots, egg, chia seed, coconut, flaxseed, and rosemary extract. 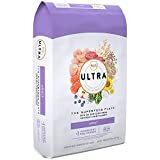 Cost per Pound: Nutro Ultra comes in 4.5, 15 and 30-pound bags averaging just under $2 per pound. Guaranteed analysis shows 25% protein, 14% fat, and 4% fiber. Blue Freedom is a line from the Blue Buffalo family of dry dog food products. This line focuses on a gluten-free product that uses beef over chicken. Main Ingredients: Beef, turkey meal, tapioca starch, potato, and pea. Other Ingredients to Note: Chicken fat, pea protein, fish oil, flaxseed, chicken meal, cranberries, blueberries, rosemary oil, kelp, parsley, barley, and alfalfa. Cost per Pound: Blue Freedom’s blend averages about $2.05+ per pound. The guaranteed analysis, which is required within the AFFCO labeling procedure lists Blue Buffalo Freedom at 22% protein, 13% fat, and 6% fiber. Whole Earth Farms focuses on natural nutrition. Their kibbles are made in the United States and contain probiotics for easier digestion. It is harder to find locally, especially in big box pet stores. You can purchase it online with ease from third-party sellers. Main Ingredients: Chicken meal, turkey meal, oatmeal, pearled barley, and brown rice. Other Ingredients to Note: White fish, alfalfa meal, salmon oil, sage, thyme, cinnamon, and rosemary. Cost per Pound: Whole Earth is one of the cheaper formulas available averaging just over $1.50 per pound. The guaranteed analysis shows 26% protein, 13% fat, and 3.5% fiber. 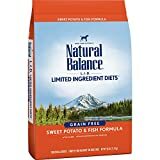 Natural Balance uses a LID recipe (limited ingredient diet) for dogs with sensitivity to grain. Omega-3 fatty acids are added in for healthier coats, while only single animal proteins are used to prevent stomach upset. Main Ingredients: Sweet potato, salmon, Menhaden fish meal, potato protein, canola oil. Other Ingredients to Note: Salmon oil, dried potato, rosemary extract, biotin, folic acid, and salt. Cost per Pound: Comes in 4.5, 13 and 26-pound bags averaging $2.29 per pound. Guaranteed analysis shows 21% protein, 10% fat, and 5% fiber. Diamond Naturals focuses on real protein, nutrient-dense fruits and vegetables, and a probiotic blend for easier digestion. All Diamond Natural products are made in the U.S. and do not feature corn, wheat, filler, artificial flavors or colors. Main Ingredients: Beef meal, peas, ground white rice, egg, yeast. Other Ingredients to Note: Chicken fat, pumpkin, blueberries, quinoa, oranges, dried kelp, coconut, spinach, carrots, papaya, beet pulp, kale, and chia seeds. Cost per Pound: Comes in a 40-pound bag averaging under $1 per pound. Guaranteed analysis shows 25% protein, 15% fat, and 4.5% fiber. Taste of the Wild’s prairie version is still grain-free but focuses on animal proteins over fish. They still use their proprietary probiotic blend along with added Omega-3 and Omega-6 fatty acids. Main Ingredients: Buffalo, lamb, chicken meal, sweet potatoes, and peas. Other Ingredients to Note: Egg, bison, venison, beef, tomato, ocean fish meal, dried chicory root, tomatoes, blueberries, raspberries, and yucca extract. Cost per Pound: Comes in 5, 15, and 30-pound bags averaging $1.63 per pound. Guaranteed analysis shows 32% protein, 18% fat, and 4% fiber. Blue Buffalo Wilderness focuses on a diet that mirrors that of ancestral wolves. It has high protein, antioxidants, and essential carbohydrates to keep up with your dog’s energy. Main Ingredients: Deboned chicken, chicken meal, peas, pea protein, tapioca starch. Other Ingredients to Note: Flaxseed, pea starch, dried egg, dehydrated alfalfa meal, carrots, sweet potatoes, dried kelp, cranberries, barley grass, parsley, turmeric, and blueberries. Cost per Pound: Comes in 4.5, 11, and 24-pound bags averaging $2.08 per pound. Guaranteed analysis shows 34% protein, 15% fat, and 6% fiber. 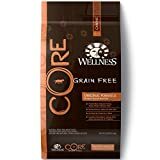 Wellness CORE focuses on grain-free diets with high-protein content, probiotics, and vitamins. They eliminate the need for artificial ingredients and byproducts by sticking to real food and all-natural preservatives. Main Ingredients: Deboned turkey, turkey meal, chicken meal, peas, and potatoes. Other Ingredients to Note: Dried ground potato, chicken fat, chicken liver, ground flaxseed, salmon oil, spinach, broccoli, carrots, parsley, apples, blueberries, kale, sweet potatoes, green tea, rosemary extract, and spearmint extract. Cost per Pound: Comes in 4, 12, and 26-pound bags averaging $2.30 per pound. Guaranteed analysis shows 34% protein, 16% fat, and 4% fiber. Buy by Dog Size: If you look at the front of a dog food bag, you will notice “small,” “medium,” or “large” breed along with the dog’s normal Only buy foods that match your dog’s weight, because they are formulated with nutrients, protein, fiber, and fat counts essential for their size. Go with Real Ingredients: Stick with foods that have real ingredients. If you read the label and cannot pronounce 75 percent of what you are reading, it is not a wholesome product. Feeding Trials: In addition to the adequacy statement, you should see a trial statement assuring the food underwent an AAFCO procedural assessment. This statement means the company tested the food on living dogs to ensure they enjoyed it, but also were healthy from it. Ask Your Veterinarian: No one knows your dog’s dietary needs better than your veterinarian. Your vet takes into consideration your dog’s lifestyle, history, and genetics to help you decide which pet food is best. They can also recommend maximum calories per feeding, and whether your dog needs high grain or grain-free. Check for Recalls: Not all pet stores are diligent about removing recalled products from their shelves. Luckily, you have two sites you can use as a resource for recent recalls. The S. Food and Drug Administration and the AVMA both have recalls and alerts for all varieties of dog food and treats. BARF, biologically available raw food, is a new fad for pet food. Some proponents will argue that BARF is the only correct diet for dogs, but if done improperly, it could lead to catastrophic consequences for your dog. Realize that BARF, according to Cesar Millan, is only for dogs with medical conditions like immune disorders or skin conditions. In most cases, dogs are better off with high-quality commercial dog foods using natural meat products. Feel free to share your opinion on the best dry dog food out there or whip up something special for your fur baby by looking over the DIY recipes we have on the site.